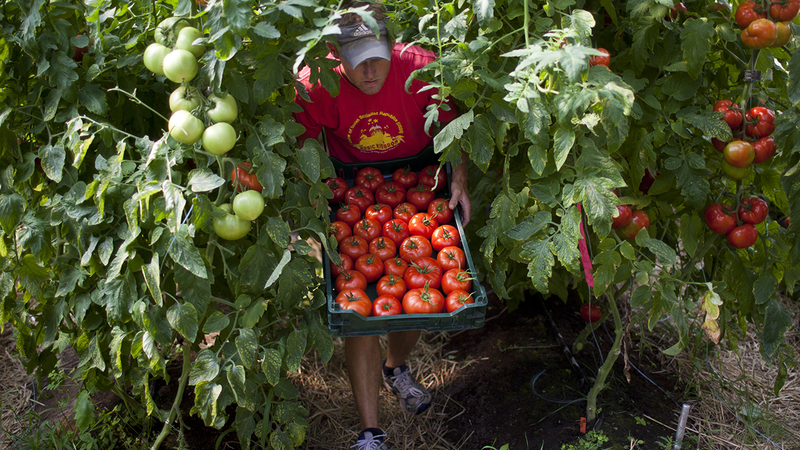 Organic farming is on the rise in the U.S. There were more than 14,000 certified organic farms in the United States in 2016, according to the latest available data from the U.S. Department of Agriculture’s National Agricultural Statistics Service. This represents a 56% increase from 2011, the earliest comparable year. And while California remains king when it comes to the number of organic farms, several other states saw dramatic growth in organic farming over this time, particularly in the South. As the number of organic farms has increased, so too have sales of certified organic products: U.S. farms and ranches sold nearly $7.6 billion in certified organic goods in 2016, more than double the $3.5 billion in sales in 2011. Still, organic farming makes up a small share of U.S. farmland overall. There were 5 million certified organic acres of farmland in 2016, representing less than 1% of the 911 million acres of total farmland nationwide. Some states, however, had relatively large shares of organic farmland. Vermont’s 134,000 certified organic acres accounted for 11% of its total 1.25 million farm acres. California, Maine and New York followed in largest shares of organic acreage – in each, certified organic acres made up 4% of total farmland. The rise in organic farming in the U.S. coincides with Americans’ growing appetite for organic food over the past few decades. According to the USDA’s Economic Research Service, retail sales of organic foods expanded rapidly from 1994 to 2014. And in 2015, the Organic Trade Association estimated U.S. organic retail sales at $43 billion, representing double-digit growth in most years since 2000, when the USDA established national organic standards. Federal spending on organic agriculture has also grown in recent years. The 2014 Farm Act, for example, helped organic producers with the cost of organic certification (among other things). More recently, Congress passed an $867 billion farm bill that includes funding for organic farming research. Certified organic food, according to the Agriculture Department’s definition, must be produced without the use of conventional pesticides, petroleum- or sewage-based fertilizers, herbicides, genetic engineering, antibiotics, growth hormones or irradiation. Certified organic farms must also adhere to certain animal health and welfare standards, not treat land with any prohibited substances for at least three years prior to harvest, and reach a certain threshold for gross annual organic sales. U.S. organic farms that are not certified organic are not included in this analysis. About four-in-ten U.S. adults (39%) say that most or some of the food they eat is organic, while 61% say not too much or none of their food is, according to a recent Pew Research Center report. People in higher income families are especially likely to say this (48% of those who make $100,000 a year or more) compared with those making less than $30,000 a year (33%). Americans are closely divided over whether organic fruits and vegetables are better for one’s health than conventionally grown foods. About half of U.S. adults (51%) say organic produce is neither better nor worse than non-organic produce, while 45% say organic is better. Younger Americans and those who report eating at least some organic food are more likely to believe organic produce provides health benefits. There are also consistent differences in beliefs about food additives between those who report consuming more organics in their diet and those who don’t. About two-thirds of people who say at least some of what they eat is organic (65%) believe that food additives generally pose a serious health risk. In comparison, 41% of those who report eating no organic food or not too much say this. This gap also appears when looking at beliefs about fruits and vegetables grown with pesticides and meat from animals given antibiotics or hormones. Correction: A previous version of this post gave an incorrect value for total sales by U.S. certified organic farms in 2011. It was $3.5 billion. Kristen Bialik is a former research assistant at Pew Research Center. Kristi Walker is an interactive designer at Pew Research Center.